Idyllically situated in a park, the 4-star superior hotel has 45 individually furnished rooms and junior suites - all with Wi-Fi and air conditioning. In the exclusive hotel resort on Lake Thun there is a spa area - with outdoor brine bath, salt cave, Finnish sauna, bio sauna, steam bath, experience showers, indoor pool, relaxation areas and treatment rooms for massages - a restaurant, a bistro-bar, a smokers lounge and a conference center. An on-site parking garage is available. 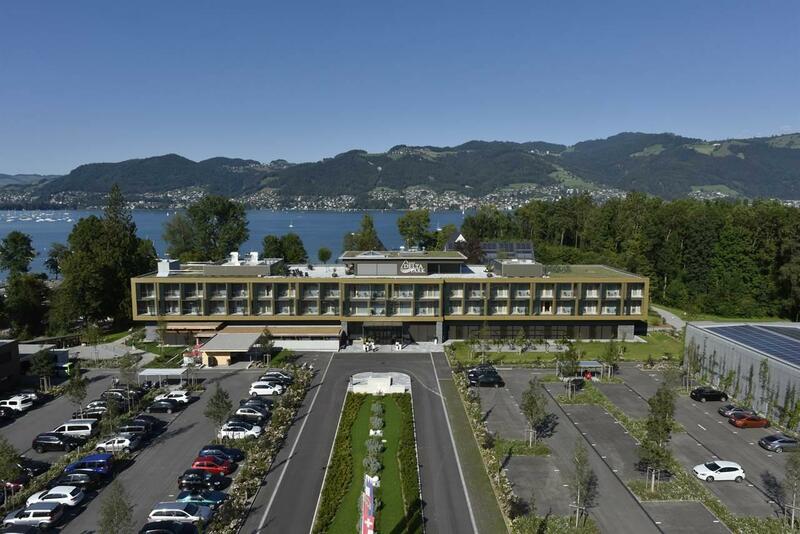 WELCOME TO HOTEL RESTAURANT BELLEVUE AU LAC The 3-star Superior Hotel Restaurant Bellevue au Lac is located in the heart of Hilterfingen, directly on the shores of Lake Thun. The hotel was built in 1918 and combines the charm of the Belle Epoque with the standards of modernity. Look forward to breathtaking views, renovated hotel rooms, a restaurant with lakeside terrace, a hotel bar and various banquet and seminar rooms. Recently renovated 3-room holiday apartment at the 3rd floor of an apartment building. There's a great playground for children. Location directly beside the children's skilift. Panoramic view towards the rear Diemtigtal. Quiet location close to the mountain railways (Wiriehorn) and the hiking paths. Located on the area of the Deltapark Vitality Resort, directly on the lake, surrounded by a beautiful nature reserve, between Thun and Interlaken.19 rooms with individualizied layouts, for example with cozy bay windows. The Deltaspa ist located only a few convenient steps away, is all about fitness and alpine wellbeing. Located at Lake Thun, the Schadau Castle is a heritage building embedded in the Schadau Park, with imposing lake and mountain views. The castle has originally been built in 1854 as a private summer residence. After an extensive renovation, the Schadau Castle reopens with nine rooms and suites, one restaurant, one bar, lakeview terrace as well as a generous garden. Schadau hotel guests can use the 200-meter distant Hotel Seepark's spa free of charge. City center and railway station are one bus stop or a 15 minutes' walk away. 3-room holiday apartment at the 1st floor of a freestanding semidetached house, which has been built in 1775 and totaly renovated in 1979. There is a large meadow around the house. Quiet location with panoramic views at 1158 m above sea level. Close to the hiking paths, the cross country ski trail and to the water-playground "Gwunderwasser". The skiing areas Wiriehorn and Grimmialp are accessible within 5 minutes by car. The busstop "Tiermatti" is in walking distance. Newly renovated Boutique Hotel right at the front on the bay of Spiez. Excellent location at the lake Thun with stunning views of the mountains and watersports. Only 2 minutes away from the Castle of Spiez and it's vineyards. 7 new double rooms in the Restaurant-Hotel Chemihüttli in a countryside area. Restaurant with a beautiful view over the lake of Thun and Brienz. 5 minutes walking distance from the bus stop to the hotel. "Small but nice" - Newly opened private boutique hotel with modern and tastefully furnished rooms. Central location in the middle over the city of Thun with sensational views over the Lake of Thun and the region. Geschichtsträchtiges Hotel an ruhiger Lage zuhinterst im Diemtigtal. Unser christlich geführtes Haus ist ein schöner Ort, um sich verwöhnen zu lassen. Das Hotel verfügt über 105 Betten in 41 Zimmer. Einzelgäste, Familien oder Gruppen sind herzlich willkommen. Das Hotel ist idealer Ausgangspunkt für Wanderungen, zum Skifahren und für Skitouren. Earth tones, wood, cotton and linen reate a homely atmosphere. The 100 year old building has amazing features such as the original hand made oak beames and suprisingly fancy details. The 15 rooms are individually designed with different themes. The-5-color-concept is something that all our guests find appealing. Our rooms are charaterized by high quality material in a functional asthtic design with wooden flooring and gentle colors. You can be guaranteed a good night sleep in our *****-level Jensen boxspring beds. Leave all your daily cares behind, relax and switch off. Should you need internet access, you can surf with our Samsung SuitePads. Free Wi-Fi is available throughout the building and there are multiple areas that are creativly furnished to enable you to work in a comfortable environment. To recover, to relaxe, to enjoy: a quiet sunny place to stay at 1040 m. Marvellous view of Lake Thun and mountains. Hiking area. Culinary restaurant with meat from our farm with own label: "Suma-Natura Gourmet-Beef". Ideal for family occasions, banquet s and seminars.